The Architect’s Newspaper: What inspired Rise Nation? Did the client have specific ideas of what they wanted? Michael Szivos: The client is a gym that provides an experience much like a spin class but with climbing machines. The brief was for an interesting light installation that responded to the music played during workouts. [Rise Nation] approached Lucas Werthein, a technology director and friend of ours, about the project and once they decided the best approach would be to design something that was both physical and interactive, Lucas brought us in on the project. The initial inspiration was to produce an installation that evoked a rocky surface. This is the case when the lights are on, but during workouts the room is dark and the lighting is the only thing that is visible. What was interesting for us is this contrast. The seams between the rocky surface panels provide a lighting pattern that when animated is like lightning. On the one hand, the installation appears like something solid, and on the other, it is very ephemeral. Oddly enough it is the formal overlaps between these two opposite systems that give them both their unique character. What was the most difficult aspect of the design or production process? The biggest issue was that [Rise Nation is] out in L.A. and the installation had to be put in pretty quickly. We had everything fabricated here in New York and shipped to Los Angeles, then assembled on site. The structure is made of all flat pieces of aluminum. Although it was challenging doing it across the country, it was our first permanent piece, which was really rewarding, and we have learned a lot from the project. What can we expect to see from SOFTlab in 2016? We are currently working on 3M’s experience for South by Southwest, a large installation for a lobby renovation in the Financial District in New York, and on a product booth for a lighting company that will be installed in a number of shows around the world. We also just finished an exhibition with our friends at Tellart in Dubai for the World Government Summit as well as a permanent installation in the new 21c Museum Hotel in Lexington, Kentucky. SOFTlab is doing a number of permanent installations, which is a great progression for us, and we have permanent lighting installations on the boards for a landmark building in L.A. and a flagship store in New York. Suburban folk mark the change of seasons with spring peepers, the sound of leaf blowers, and first frosts. City dwellers rely on other environmental cures: pumpkin spice lattes, heat season, and festive public art installations. Last week, the Flatiron/23rd Street Partnership Business Improvement District (BID) and the Van Alen Institute welcomed crowds to SOFTlab's Nova, the 2015 winner of the Flatiron Public Plaza Holiday Design Competition. Perched inside North Flatiron Public Plaza at the intersection of Broadway, Fifth Avenue, and 23rd Street, Nova invites passersby into a kaleidoscopic interior to view area landmarks—the Empire State Building, the Flatiron, and the Met Life Tower—on its mirrored surfaces and through its many exposures. 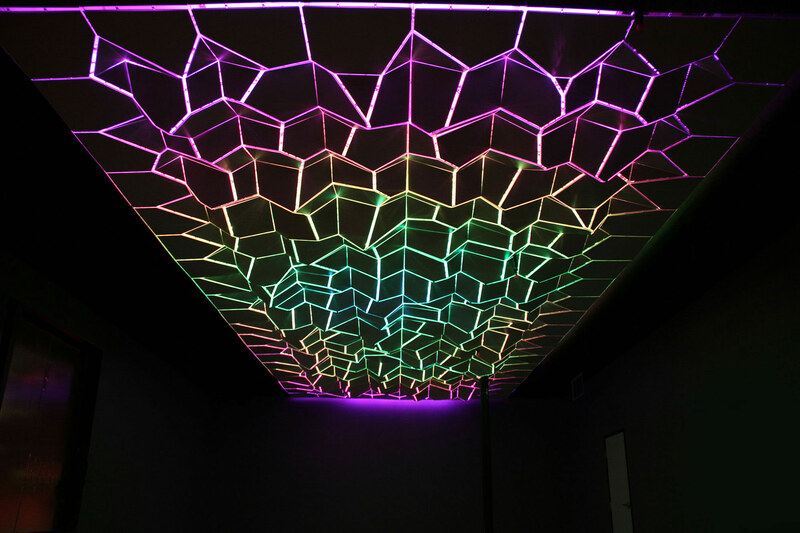 When activated by sound, LEDs pulse to intensify the psychedelic visuals. 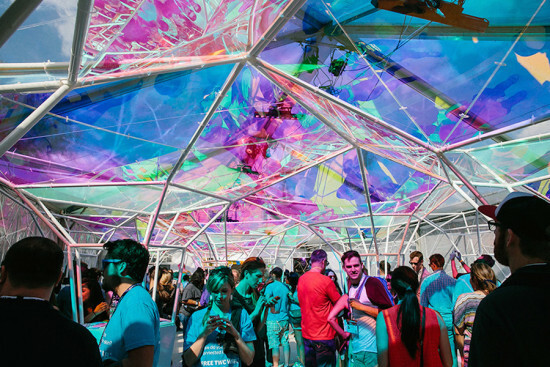 The design has definite antecedents in SOFTlab's pavilion at this year's SXSW music festival in Austin, Texas. Here too, the firm partnered with 3M to create a multicolored neon canopy that showcased the company's products. Van Alen and the Flatiron/23rd Street Partnership invited New York–based architecture and design firms Bureau V, Method Design, Sage and Coombe, Studio KCA, and SOFTlab to submit proposals for the competition. Competition jurors included Van Alen and the Flatiron/23rd Street Partnership directors and board members; Michael Bierut, partner, Pentagram; Aleksey Lukyanov, partner, Situ Studio; and Wendy Feuer, NYC Department of Transportation's Assistant Commissioner of Design + Art + Wayfinding. "The installation illustrates how interactive public art can change the perception of an environment thereby allowing people to experience it in a new way," Feuer explained in a statement. "We count on organizations like the Partnership to commission these exciting installations making NYC streets ever more inviting." This is the holiday design competition's second year. Last year, INABA won the competition with their installation, New York Light. See the gallery below for more images of Nova. 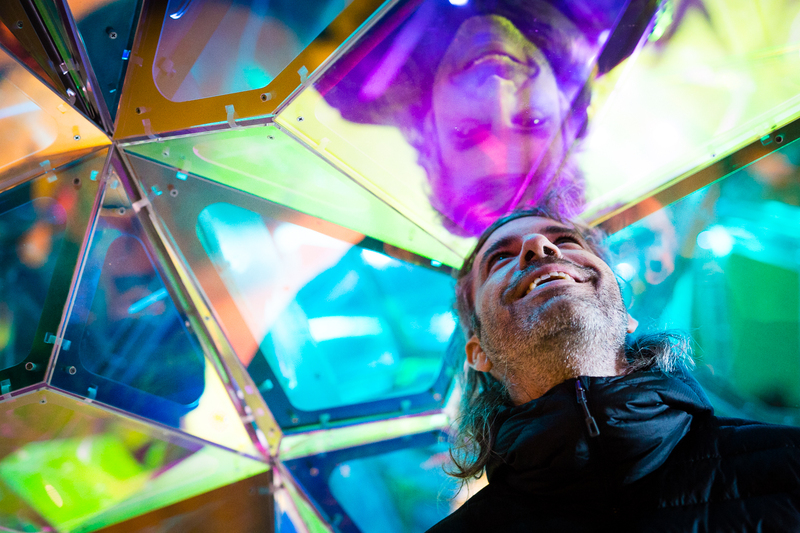 A household name in resilient scotch tape and self-adhesive velcro, 3M wowed the crowd at South by Southwest 2015 (SXSW) with a 3D-printed pavilion awash in kaleidoscopic colors, with every inch of the structure designed to showcase a 3M product at work. 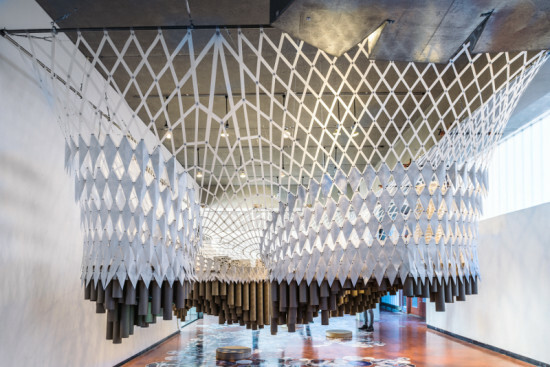 SOFTlab collaborated with 3M and BBDO to create the pavilion, a continuous modular structure made from powder-coated aluminum pipes, which assembled within minutes. The easy-build structure was composed of over 1,200 unique 3D-printed joints and sockets with a rotating snap, so that even the proverbial monkey could rise to the occasion. Overhead, more than 3,000 3M cable ties were used to construct the display and bar elements, as well as the complex dichroic ceiling. Responsible for the phosphorescent glow of shifting color, like the inside of a soapy bubble, was the exterior clad in custom Scotchlite fabric held together with zippers—one of the only times the retroreflective material has been deployed on an architectural scale. These panels of material reflected the highly saturated colors generated by 3M’s dichroic film-a-thin-filter, which creates saturated hues from light. An all-white interior played up the colors even more, coated in a glossy white di-noc laminate, an architectural finish by 3M. Meanwhile, a dichroic film laminate on the acrylic cladding of each crystalline-shaped column added to the glimmering quality of the interior, and flooded the visitors in color. The clever intricacies of the structure plunged visitors into the world of material science, a domain in which the multinational conglomerate predominates. Forget about the Sharknado, New York–based designers at SOFTlab have created a vortex of flowers that has taken over one Manhattan shoe store, bringing SOFTlab's signature parametric forms to the modern shoe brand, Melissa. The Soho store already grabbed design headlines when it opened its flagship location decked out in a custom-fabricated Corian interior by architecture firm Eight and Associated Fabrication. This latest design intervention is part of Melissa's "We Are Flowers" campaign that used organic shapes and colors to inform its shoe line. 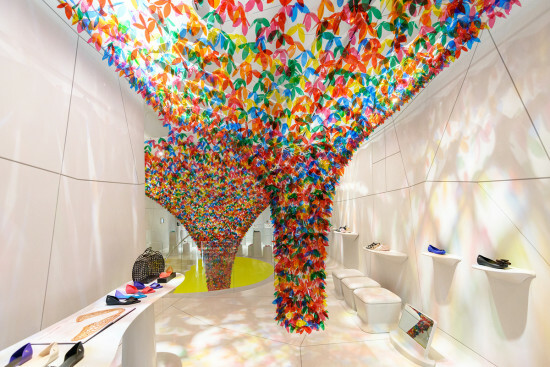 SOFTlab was the chief designer behind “We Are Flowers” and, as the title suggests, created a looming art installation of synthetic flowers right inside the Melissa flagship. Using bright colors and familiar natural forms, the installation creates an aesthetic meant to appeal to both shoppers and pedestrians just passing by. And with 20,000 distinct flowers, it's difficult to miss. The installation, as it happens, is an encompassing, immersive one that hangs over the top of the store in its entirety. 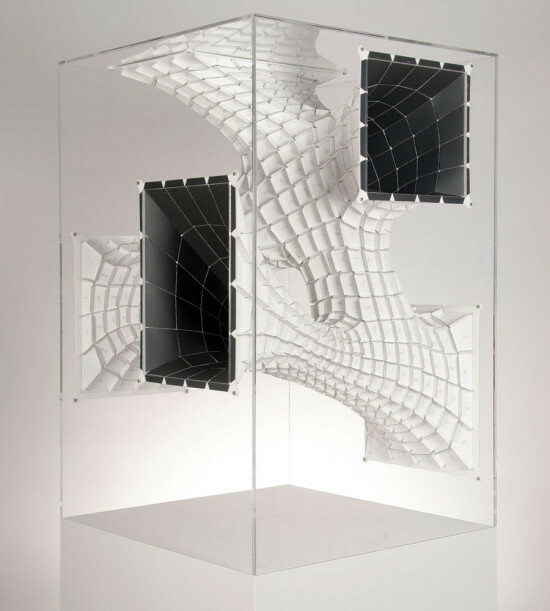 This is achieved by suspending the flowery panel from a hand-bent metal frame. The underlying digitally-designed mylar structure that supports the flowers is comprised of fastened, laser-cut pieces that give the final product its curving shape. The flowers are also laser cut and individually hand-fastened to the delicate netting. The process is detailed in the installation video above. The final product is a gleaming interior garden at Melissa that winds its way through the entire store. The We Are Flowers installation is currently on view at Melissa's Manhattan flagship at 102 Greene Street. A new exhibition helps a New York-based firm explore indoor and outdoor applications of a new building material. Starting with the idea of a vertical atrium, which often includes biophilic elements like water features and indoor gardens, the SOFTlab design team envisioned an ATRIUn, a uniquely shaped building feature that uses the durability of Dekton’s stone-like properties to bring the outdoors in. ATRIUn is sponge shaped, and breaches the structure’s exterior at various points. “It forms an interior plaza in a building, not as something that’s flat, but spans the height, width, and depth of the building,” Szivos said. The form was generated in Maya. After inserting the apertures along the quadrilinear volume, the physics simulation plug-in generated the smooth, sinuous surface across various levels. For its larger projects, Szivos says the firm typically solves engineering challenges with Arup through an advanced finite software analysis software program. Those optimized, large designs are then sent to Tietz-Baccon, their long-time local fabricator. However for smaller projects where SOFTlab fabricates its own models and project components, the physics tool provides a close approximation of Arup’s services. To generate a model of ATRIUn’s design for the exhibition, the designers translated the Maya drawing into Rhino with Grasshopper to feed to their in-house laser cutter. Since the design was modeled in paper, four sided shapes were fabricated. If the design was realized in Dekton, triangular shapes would be necessary to achieve the complex curvature of the ATRIUn skin. The set volume was 24 by 24 by 36 inches, scalable for a building between 10 and 12 stories. 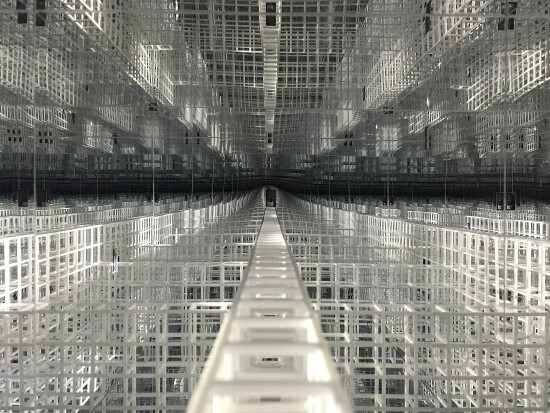 ATRIUn and Surface Innovation is on view at the Center for Architecture in New York through October 31. The Architectural League of New York has recently announced the theme and location of it's annual Beaux Arts Ball for 2012. 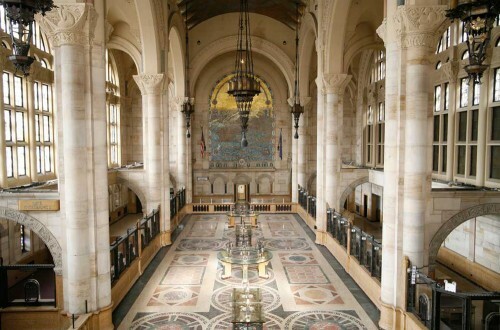 The event itself will be held on Saturday, September 22, in the Williamsburgh Savings Bank in Downtown Brooklyn. Emerging architects SOFTlab will be in charge of realizing this year's theme, "Tender," within the space. Recognized as one of the premier annual gatherings of the architectural and design community in New York, the Beaux Arts ball typically attracts over 1,000 architects, designers, artists, and friends annually. First held in New York City in 1913 by the Society of Beaux Arts, the gathering was revived in 1990 by The Architectural League to benefit its ongoing architecture and design programs, including lectures, exhibitions, and publications. As an icon of the Brooklyn skyline, the Williamsburgh Savings Bank is sure to wow guests and be remembered as yet another architecturally significant venue. The festivities will take place underneath the 63-foot high ceilings of it's former banking hall and architects from design studio SOFTlab in collaboration with Natasha Jen of Pentagram will design the space for the evenings festivities. The theme, "Tender," with it's multiple interpretations as noun, verb, and adjective will shape their design. Tickets for this event can be purchased in advance at archleague.org and at the door that evening. The results are in and the winners of the 31st annual Architectural League Prize for Young Architects + Designers were announced on Friday. The recipients of the 2012 awards are: Jorge Arvizu, Ignacio del Rio, Emmanuel Ramirez, and Diego Ricalde, MMX Studio, Mexico City; Jimenez Lai, Bureau Spectacular, Chicago; Sean Lally, WEATHERS / Sean Lally, Chicago; Seung Teak Lee and Mi Jung Lim, STPMJ, Brooklyn; Michael Szivos, SOFTlab, New York; and Koji Tsutsui, Koji Tsutsui & Associates, San Francisco and Tokyo. Formerly the Young Architects Forum, the League Prize is considered one of North America's most prestigious awards for young architects. The renderings and images reflect the theme of this year's prize, No Precedent. League committee members and competition jurors valued the competition entries based on a perception of the career of a young architect. According to the League's announcement, jurors sought "ideas, works, and methodologies that are unfounded, ungrounded, and suspect…the things no one has done before, and that one has little experience with.” The winners reflected the notion of their burgeoning careers by displaying work that is, “suggestive, speculative, and on the brink." 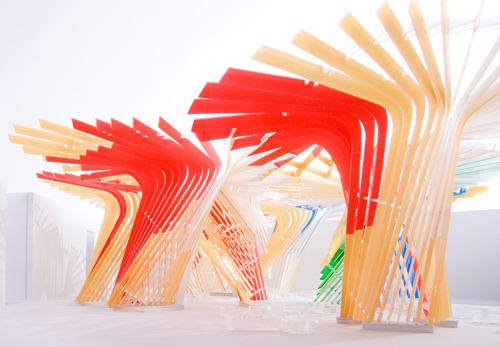 Beginning June 21st, the winners will display their work at Parsons The New School for Design. Their work will also be featured in a new volume of the Young Architects series jointly published by Princeton Architectural Press and the League. The New Practices New York juried portfolio competition took place on Wednesday. This biennial competition, sponsored by the AIA New York chapter and now in its third iteration, has quickly become one of New York City’s most important launching pads for architects who have been in practice for less than five years. The winners are featured in an exhibition at the Center for Architecture, which usually travels to the national AIA convention and other architectural societies (this year’s winners will be featured in Sao Paulo, Brazil) plus a one-year free membership in the AIA and visibility as a firm on the rise in this highly competitive city. This year’s jury included Toshiko Mori as lead juror, Joe MacDonald (a New Practices winner in 2008), Guy Nordenson, Galia Solomonoff, and yours truly. After reviewing nearly 70 portfolios and much wrangling about what makes a good presentation—debating the value of portfolios with only theoretical and unbuilt work versus those with completed projects, and whether work done in earlier offices of employment for young architects should be included—we selected seven winners. The winning 2010 firms are: Easton+Combs, which earned the highest honor, and whose entry for the P.S.1 Young Architects program is pictured above, along with: Archipelagos Leong Leong Manifold SOFTlab SO-IL Tacklebox Congratulations to the winners!